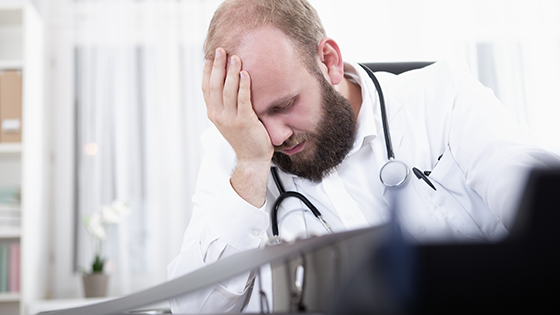 More than half of physicians in the United States now experience at least one symptom of burnout, according to a study conducted by the Mayo Clinic and American Medical Association, which evaluated physician responses to surveys conducted in 2011 and 2014. Rates of burnout were highest among emergency physicians, with more than 60 percent of them reporting at least one symptom of professional burnout in 2011, which increased to more than 70 percent in 2014. But non-emergent sectors of medicine, including urology, rehabilitation and family medicine, were close behind. When physicians burn out, everybody loses: Patient care declines, staff morale suffers and the physicians lose satisfaction with their jobs. Burnout also contributes to a physician suicide rate that's more than twice that of the general population. Working as a physician can be stressful, both physically and mentally. But in the typical course of things, if a physician gets adequate time to rest between shifts, he can recover quickly from the stress. When he finds himself unable to recover between shifts -- or even during a short vacation -- you know you have a serious problem. A chaotic environment can do a lot to exacerbate the natural exhaustion of working in a high-intensity profession. And that doesn't only mean the high-stakes, always changing world of the emergency department. Less dramatic factors, such as a changing schedule that frequently interferes with family events, differences in core values with practice leadership or staff, and having little to no control over when they work can all contribute to physician exhaustion and burnout. "Depersonalization" is exactly what it sounds like: A failure or reluctance to connect on the personal level, which may come across as a lack of caring. Every practice has its difficult patients, of course. But when physicians start taking a sarcastic or cynical approach in general, blaming patients for their own ailments, or if a formerly caring doctor suddenly distances himself from any emotional connection with patients -- and perhaps also staff -- something is definitely wrong. A fatigued, burned out physician who has become emotionally detached may start asking themselves: Why bother? What difference am I making, anyway? This thought process may manifest outwardly as decreased efficiency in any aspect of the job, whether it's increased errors in chart notes and prescriptions, poor communication with the patients, or slower, less efficient patient visits in general. Proactive use of a screening tool like the well-being index can help catch these symptoms of burnout before they're obvious to the casual observer. That, in turn, safeguards the well-being of your patients, your practice and your physicians. This is an investment well worth making: And as the core of your treatment team, happy physicians make for higher staff morale, quality patient care and reduced turnover among both patients and staff at any medical facility.